Last night I saw Moonlight (wonderful movie, unexpectedly romantic) at my local Carmike 16 and it was an absurdly bad experience -- it was way off in the very last screening room which was absolutely freezing even though it was relatively warm outside yesterday. The trailers all played in Scope with the curtains only open to 1.85; I checked IMDB on my phone and saw that the movie was 2.35 and braced myself for a problem. As soon as the A24 logo came on I realized the curtains weren't opening any further; this was no minor issue, as of course huge parts of the picture were blocked off, characters' faces, etc., yet other people seemed weirdly oblivious to it. I went out into the lobby twice and talked to two different people to try to get it fixed; unfortunately neither was a manager or a person who could do much beyond passing it on (there is never anyone with authority in sight at these places, it seems), so it ended up taking half an hour. I think they eventually turned the air conditioning off or the heat on after about an hour as well, but both problems were incredibly distracting. The audience was also annoying. Broken record in this thread but I feel like cinemagoing gets worse and worse for me every time I go out, largely of course because multiplexes seem to be so badly managed, neither the employees nor the customers really seem to care about anything, and that's my only option here. But I'm conflicted, because I feel I'd have regretted it forever if I didn't see this particular movie, which is so visually stunning, projected -- and obviously the film's virtues shone despite everything. While I'm at it, in December I saw Manchester by the Sea at an even worse theater, a rural four-screen place, and they didn't turn the lights all the way off, plus Rogue One next door overwhelmed the dialogue at times. I felt like I was seeing a movie in a warehouse. Anyway, uh, thanks for listening. Sitting at HOME, Manchester waiting for Toni Erdmann to start. Completely sold out with an immaculately behaved audience. We're pretty blessed here. What I loved is that my theater was stunned into silence before that reveal presumably because black man + white woman + cops is a fairly uneasy thing. The reveal turned that tension into relief though. Bit of a trial but I have finally got to Stephane Brize's latest 'A Woman's Life'. First attempt on Thursday 9 March 2017 failed as the film, which was being screen digitally, like most things these days would not play. So purchased tickets to the next screen today (Sunday) 19 March 2017. Waiting in the foyer ready to go in when the fire alarm goes off and the entire complex was evacuated. We hung around and half an hour later people were allowed back into the cinema. We took our seats and then the film started playing without any image on the screen. Our first thoughts were "Oh no, not a repeat of the other screening - we'll never get to see the film". Thankfully someone was able to correct it, the film got started from the beginning and we finally got to see it. Am very glad that I did see it as it's one of the most impressive films I have seen in recent months and it Stephane Brize's best film to date. I admit the "it wasn't bothering anyone" thing annoys me, but the guy's a nut job. I'm with her on the protective order. I agree. But having said that, it looks like they actually did figure it out quite quickly. Perhaps he could view it from a more positive perspective; an efficient mode of multitasking, where he watched a movie while simultaneously eliminating one possible future failed relationship. It took me 10 years to achieve the same thing, and I had to watch the Notebook a dozen times, so things could be worse. I can't rationalize or condone his "contact the little sister" attack vector, unless perhaps he was smitten. To be fair it is obscure compared to his most famous works. Were these guys doing an episode of I Love Films? I was intending to see Baby Driver last night with a friend and foolishly used Fandango to check showtimes, only to see that George Romero's Dawn of the Dead 3D was being screened at a theater near my house. While somewhat reticent about the 3D conversion, I convinced my friend - who had never seen the film in any form - to change our plans in order to check it out. I buy tickets online, arrive at the theater, and quickly notice that the poster outside the theater is not from the classic 1978 Romero version, but instead the 2004 Zack Snyder version with Ving Rhames and Sarah Polley. Of course, it quickly becomes clear that Fandango attached the wrong film information to the listing. We decide to stay and watch it anyway, largely because I have fond memories of seeing this version at a midnight screening on its opening night back in college with a packed crowd of horror fans who passed flasks of liquor up and down the aisles and applauded every time someone's head exploded. The audience who showed up to last night's screening were clearly not as prepared for the film, most amusingly evidenced during the scene when we see Mekhi Phifer's infected and pregnant Russian girlfriend's soon-to-be zombie baby push against her stomach from the inside, and someone five rows behind us loudly moaned, "Oh, goddammit!" Brought the house down. DarkImbecile wrote: I buy tickets online, arrive at the theater, and quickly notice that the poster outside the theater is not from the classic 1978 Romero version, but instead the 2004 Zack Snyder version with Ving Rhames and Sarah Polley. Of course, it quickly becomes clear that Fandango attached the wrong film information to the listing. This is hilarious. I am still fond of the 2004 version it really did feel like it was adding its own thing rather than be a straight money maker. Anyways how was the 3-D? It wasnt even in 3D! Fandango's botched listing was for last year's 3D conversion of the original; when I thought that's what I'd be seeing, I did a quick search to see what the reaction to that was at the time and it seemed positive. Apparently the rights owner spent $5-6 million on the conversion, so that's a sign that they might have done it right. DarkImbecile wrote: It wasnt even in 3D! Fandango's botched listing was for last year's 3D conversion of the original; when I thought that's what I'd be seeing, I did a quick search to see what the reaction to that was at the time and it seemed positive. Apparently the rights owner spent $5-6 million on the conversion, so that's a sign that they might have done it right. On the plus side, I'm on the side of carmilla that the remake was actually pretty damn good (a rarity, for sure), despite forgetting all about rigor mortis. Admittedly I'd still have felt stiffed, though! Pretty sure the remake has Phil from Modern Family, pre Modern Family obviously, playing a complete slime ball. thirtyframesasecond wrote: Pretty sure the remake has Phil from Modern Family, pre Modern Family obviously, playing a complete slime ball. This is true, but even more surprisingly: Doug Stamper from House of Cards as a redneck security guard named CJ with some fantastic facial hair. That's Phil in the background, looking like a douche even out of focus. Also don't forget Matt Frewer (Max Headroom himself!) in a small role as yet another expendable dad figure in that film. I remember being really disappointed with the 2004 Dawn of the Dead (aside from the fantastic first sequence with Sarah Polley's character getting to the mall, at which point she almost disappears from the rest of the film) until I started thinking of it as less a remake of Romero's film than as a zombie version of Aliens! (Which makes Polley's character the equivalent of Ripley, relatively sidelined until the band of marines/survivors gets whittled down at the end) There's even the equivalent scene of Gorman dragging Vasquez through the tunnels from Aliens! And the depressive coda intercut with the end credits feels like this film's equivalent of the opening sequence of Alien 3! I ended up quite enjoying it from that perspective! 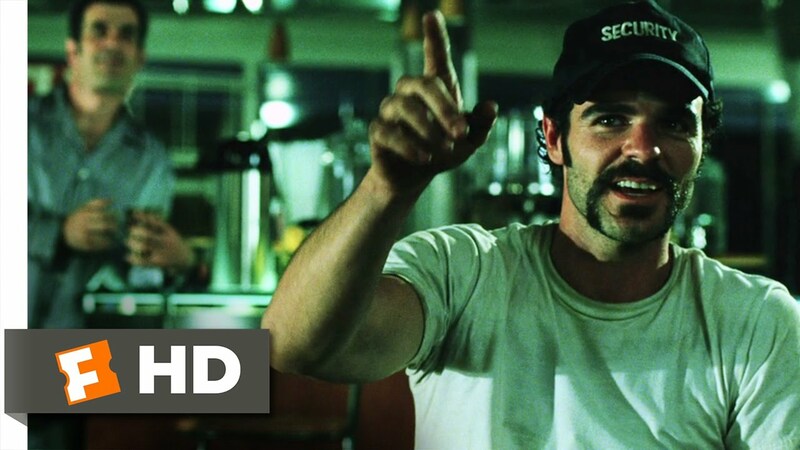 Plus of course that makes Ty Burrell aka "Phil from Modern Family" (playing the character who has "will get a horribly ironic death for being a scumbag" written all over him) this film's equivalent of Burke in Aliens! This thread makes me wonder if there's a general thread about odd happenings at the movie theater? I think I stumbled on one before. I wonder if any of our knowledgeable posters know when the culture of movie-going changed. Scorsese always talks, when he reminisces about going to movies in his childhood, about walking into various theaters and people showing up late to movies and just watching them to the end then again to the point where they started. Was Psycho the point when things changed or was it gradual? I've read of the French New Wavers also being of the type to just walk in and out of movies.